Michael Smith is predicting an exciting Posh season. Photo: Joe Dent/theposh.com. 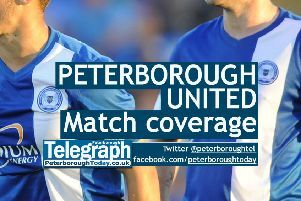 New vice-captain Michael Smith is expecting an exciting season for Peterborough United. The right-back, who has signed a new three-year contract at the ABAX Stadium, believes holding onto the club’s best players in the summer, signing some strong new ones and the appointment of Grant McCann as first-team boss are all positives as Posh prepare for a promotion tilt from League One. New signing Hayden White (left) playing against Posh. Photo: Joe Dent/theposh.com. The 27 year-old Northern Ireland international is also in favour of strong competition for every starting position, including his own. McCann’s first signing as Posh manager was Bolton right-back Hayden White. Smith, speaking to the Posh media team, said:: “I agreed the new contract a day after starting talks. It was an easy decision for me and I’m delighted to get it done so I can concentrate on playing now. “I expect the club to stabilise under Grant McCann and that is something we need. I also happen to think the football will be amazing under the new gaffer. “He’s a fan of entertaining football so there is no doubt what sort of style we will play. “The new players have all looked really good in training and we now have serious competition for places. That’s something we didn’t have in every position last season. If I was injured there was no natural right-back to take my place. “I welcome the arrival of Hayden. His presence will keep me on my toes. All the players will relish having competition for the shirt because we all know it will make us a stronger team. “We will have an unbelievable under 21 team for sure! Posh start their pre-season campaign with a friendly at Boston United on Saturday (July 9).